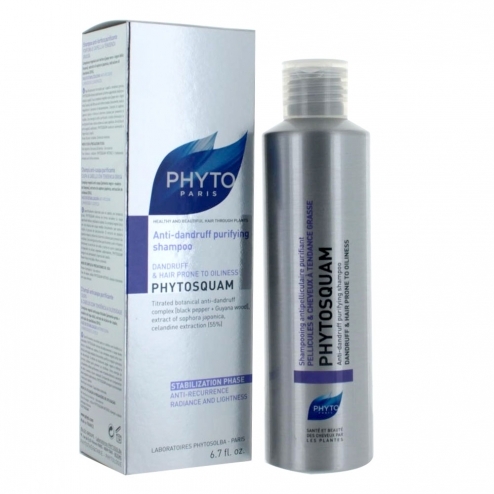 Specifically designed for oily hair, PHYTOSQUAM permanently eliminates dandruff while bringing beauty and vitality to the hair. A synergy of purifying and anti-irritating active ingredients decreases the secretion of sebum and soothes the scalp. Enriched with plant-enhancing active ingredients, PHYTOSQUAM ensures shine and lightness to the hair. The anti-dandruff complex titrated [black pepper + Guiana wood] is 100% of plant and natural origin. Unique, it combines the beauty of the hair with proven anti-dandruff efficacy. Sophora japonica extract repairs and strengthens the skin barrier to prevent recurrence. Enriched with gentian extract and celandine extraction, the scalp is soothed and the hair regains its radiance and lightness. Apply on wet hair, emulsify and rinse. Renew if necessary.